Free to use, no limitations, but any kind of warranties disclaimed. Macintosh OS X and plenty of disk space for converted files. 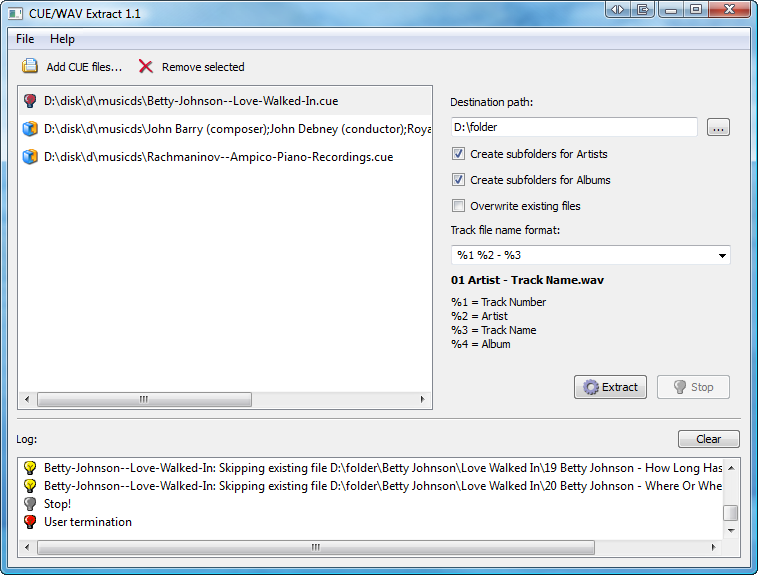 This is an utility for batch extraction of individual tracks from .CUE/.WAV audio disk images, which for instance, are created by Exact Audio Copy software. While PC users still have other methods of playing tracks from CUE files (by e.g. using Foobar2000 player, or mounting an image via Daemon Tools), Mac OS X users' choice is quite obscure, so therefore this utility comes. Posted by LCD on Tue, 11/03/2009 - 07:03. Superb little app, easy to use as 1-2-3. Thanks! Posted by Anonymous on Fri, 10/23/2009 - 21:49. Posted by Yke on Fri, 05/22/2009 - 16:06. This is just what I needed. Nice & clean app. Posted by Vada on Tue, 09/02/2008 - 19:11. Thanks for this useful tool. Transitioning from Windows back to Mac left me with hundreds of WAV/CUE pairs from my CD collection. No way was I spending the time to burn and migrate. If you already manage WAV/CUE pairs then this little tool will be no problem. Load the cue file, choose naming scheme, and click EXTRACT. Simple.